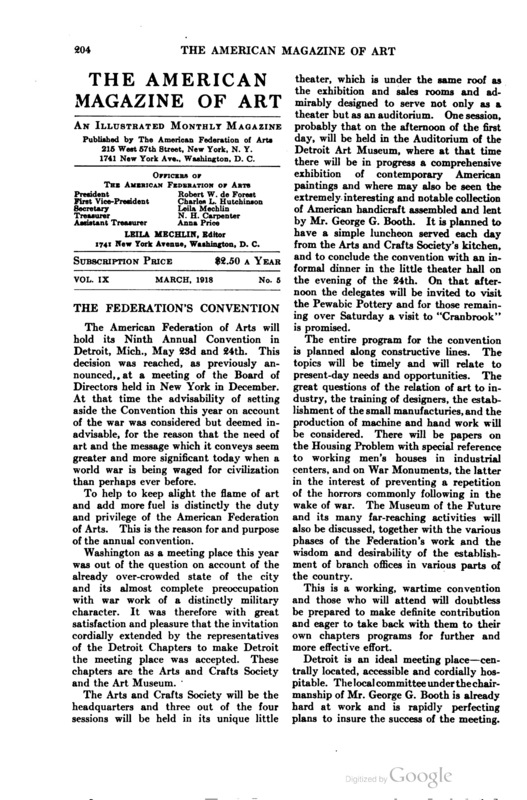 The American Magazine of Art [Art of progress], The American Federation of the Arts, New York, NY, "Notes : Works by alumni of Chicago Art Institute", volume 9, number 5, March, 1918, page 206-207, not illustrated. 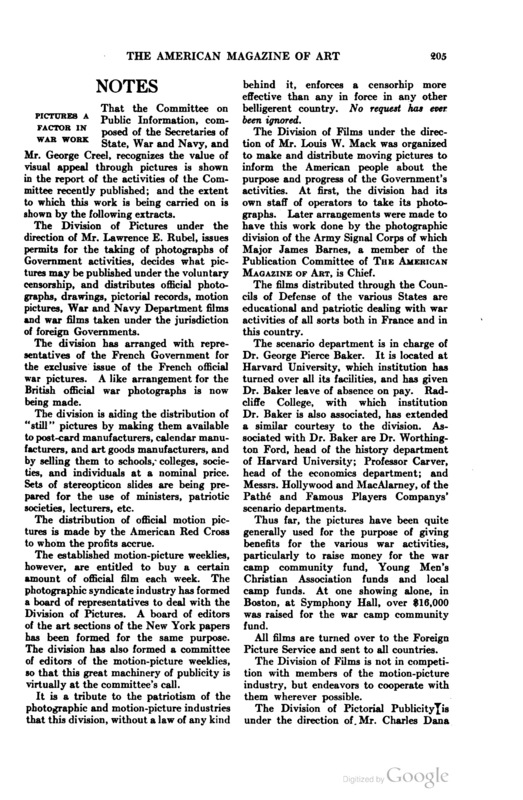 The American Magazine of Art [Art of progress], The American Federation of the Arts, New York, NY, “Notes : Works by alumni of Chicago Art Institute”, volume 9, number 5, March, 1918, page 206-207, not illustrated. 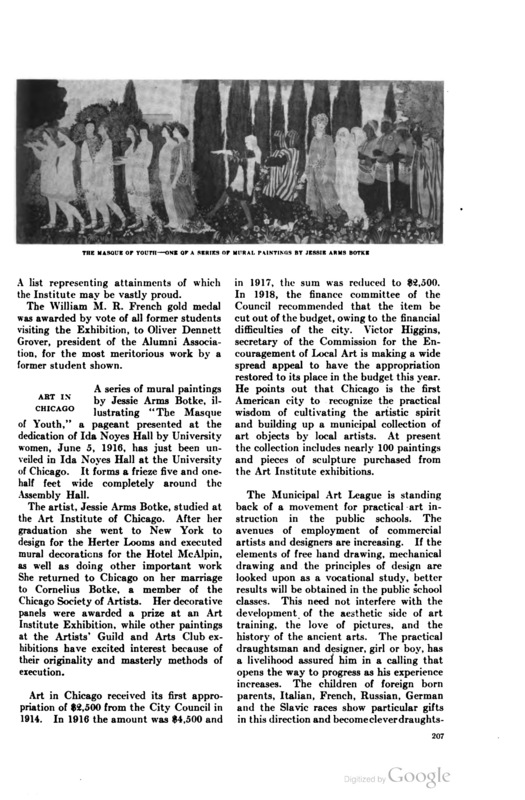 From January 8th to February 7th there was held at the Art Institute of Chicago an exhibition of the Institute’s Alumni Association. 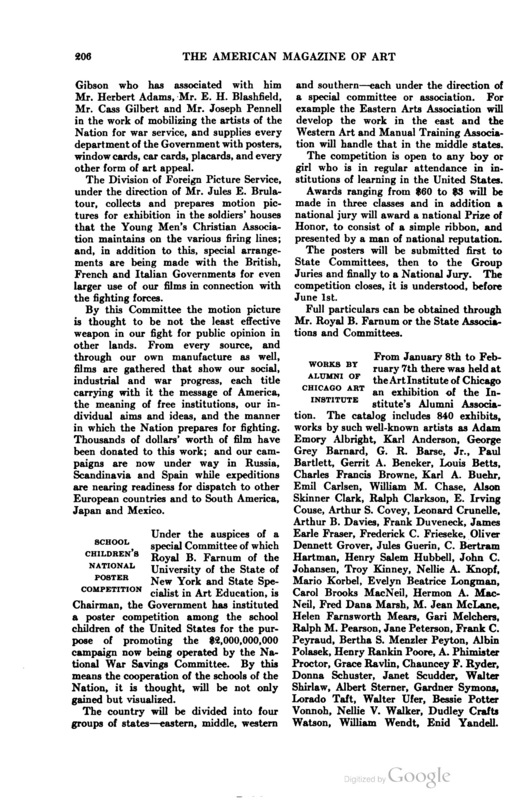 The catalog includes 840 exhibits, works by such well-known artists as Adam Emory Albright, Karl Anderson, George Grey Barnard, G. R. Barse, Jr., Paul Bartlett, Gerrit A. Beneker, Louis Betts, Charles Francis Browne, Karl A. Buehr, Emil Carlsen, William M. Chase, Alson Skinner Clark, Ralph Clarkson, E. Irving Couse, Arthur S. Covey, Leonard Crunelle, Arthur B. Davies, Frank Duveneck, James Earle Fraser, Frederick C. Frieseke, Oliver Dennett Grover, Jules Guerin, C. Bertram Hartman, Henry Salem Hubbell, John C. Johansen, Troy Kinney, Nellie A. Knopf, Mario Korbel, Evelyn Beatrice Longman, Carol Brooks MacNeil, Hermon A. Mac Neil, Fred Dana Marsh, M. Jean McLane, Helen Farnsworth Mears, Gari Melchers, Ralph M. Pearson, Jane Peterson, Frank C. Peyraud, Bertha S. Menzler Peyton, Albin Polasek, Henry Rankin Poore, A. Phimister Proctor, Grace Ravlin, Chauncey F. Ryder, Donna Schuster, Janet Scudder, Walter Shirlaw, Albert Sterner, Gardner Symons, Lorado Taft, Walter Ufer, Bessie Potter Vonnoh, Nellie V. Walker, Dudley Crafts Watson, William Wendt, Enid Yandell.